As part of the Windows Store, App Builder brings together the tools and resources you need to build, publish and market your Windows app. We’re excited to announce the launch of App Builder Rewards. This program is designed to help you get acquainted with the tools and resources for building a Windows app and have fun while you code to your heart’s content. For a limited time, you can earn points for completing quests, like coding apps, attending events, and of course publishing apps to the Windows Store and Windows Phone Store. Use the points to get cool stuff like a Windows Store developer account, Xbox games or a copy of Windows 8. 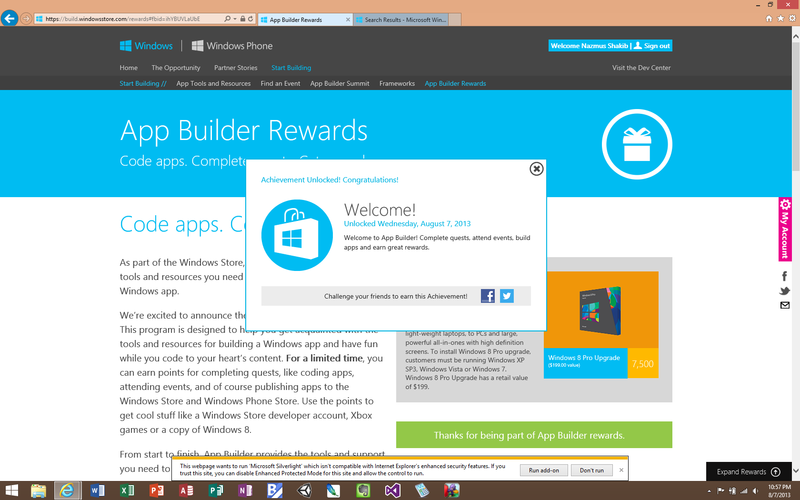 From start to finish, App Builder provides the tools and support you need to get your app in the store. If you are or are thinking of building apps for Microsoft’s platforms, it would be good idea to rack up some points while you are at it. Go here to get started. US only, as always ..